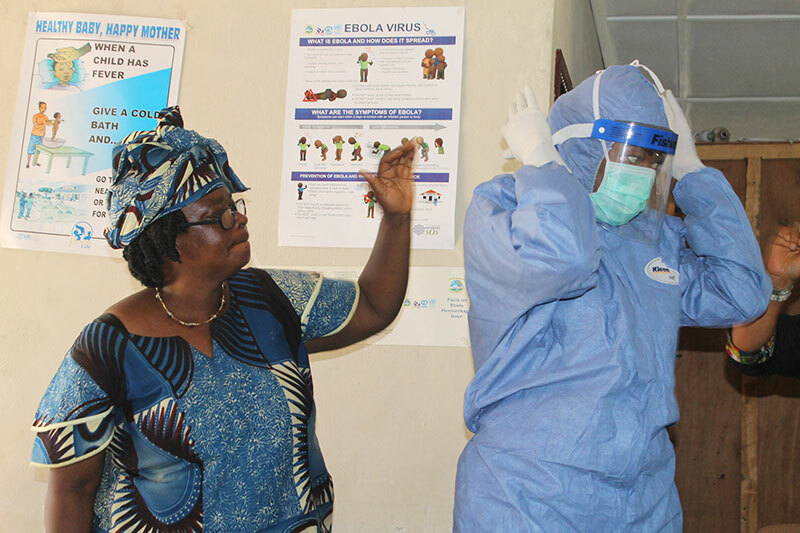 Jhpiego’s Liberia team—nurse midwives Marion Subah, Nyapu Taylor, Varwo Sirtor-Gbassie and Comfort Gebeh—lead Infection Prevention and Control training with communities during October 2014 in response to the Ebola crisis in Liberia. As the Ebola crisis overwhelmed their native Liberia, Jhpiego nurses Comfort Gebeh, Nyapu Taylor and Varwo Sirtor-Gbassie traveled from health facility to hospital, community hall to military base to provide health care workers and families caring for the ill with infection prevention and control (IPC) practices and skills. Their stock in trade included the basics—powdered chlorine, buckets, water, plastic bags and other supplies to keep those on the frontlines safe. But to ensure that their fellow nurses, midwives and physicians maintained their newly learned skills, the Jhpiego team relied on mobile phones and text messages. Mobile messaging and mentoring played a key role in shoring up the skills of frontline health care providers trained by the Liberian team. Jhpiego worked to train staff in Jhpiego-supported facilities in critical IPC practices, as well as specific messages related to the Ebola Virus Disease and reproductive and maternal health. But as with many trainings, staff went back to their posts and were faced with the daunting task of retaining key knowledge about IPC specifically related to Ebola as the crisis persisted. Jhpiego’s Liberia staff, in conjunction with the Jhpiego headquarters’ Information and Communication Technology for Development team (ICT4D), worked to set up automated, scheduled SMS to all trained Liberian health workers as reinforcement and reminders of key IPC knowledge and practices. The SMS also included reminders for health workers to take good care of themselves as they continued to fight the epidemic on the frontline. Nearly 40,000 SMS were sent to Jhpiego’s Liberian trainees over the several months following their training. For Jhpiego, an international health nonprofit and affiliate of Johns Hopkins University, preventing the spread of the deadly Ebola virus during the outbreak, protecting frontline health workers and their patients, and preparing others for the next infectious disease crisis rely on sharing best IPC practices and instilling a rigorous adherence to those measures. Jhpiego, which has a decades-long history in Liberia and Guinea, two of the countries at the center of the outbreak, is working with the respective governments to ensure that the skills of health care workers are up to date, that communities understand the importance of IPC practices at home and that health facilities practice what they preach. 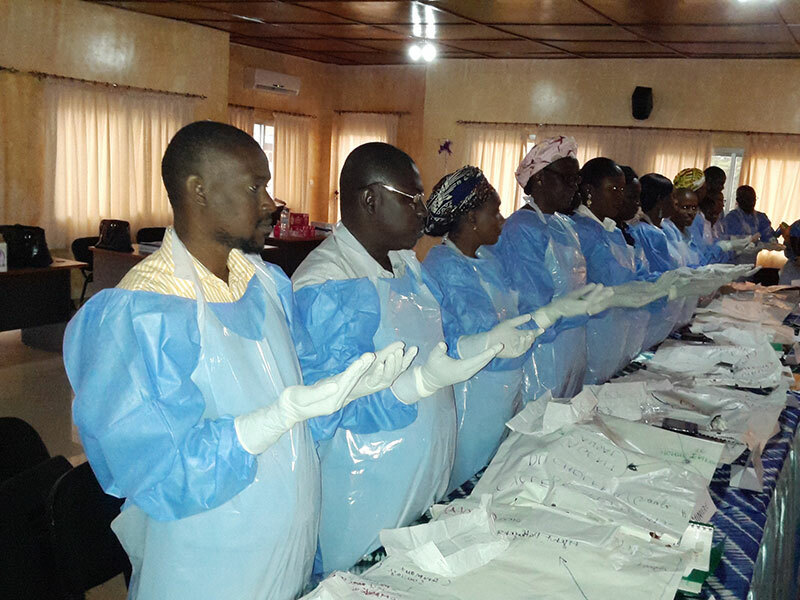 The first of two regional trainings in Ebola preparedness held in Ghana; 39 participants from nine countries. But Jhpiego didn’t stop there. Recognizing the ability of the virus to easily migrate across borders, Jhpiego IPC experts held several regional IPC trainings for health care professionals, providers and officials from more than 20 countries so that they would be prepared in the event of another outbreak. A new, updated manualwas used during these workshops to ensure that colleagues in the field had the best training available at the time. 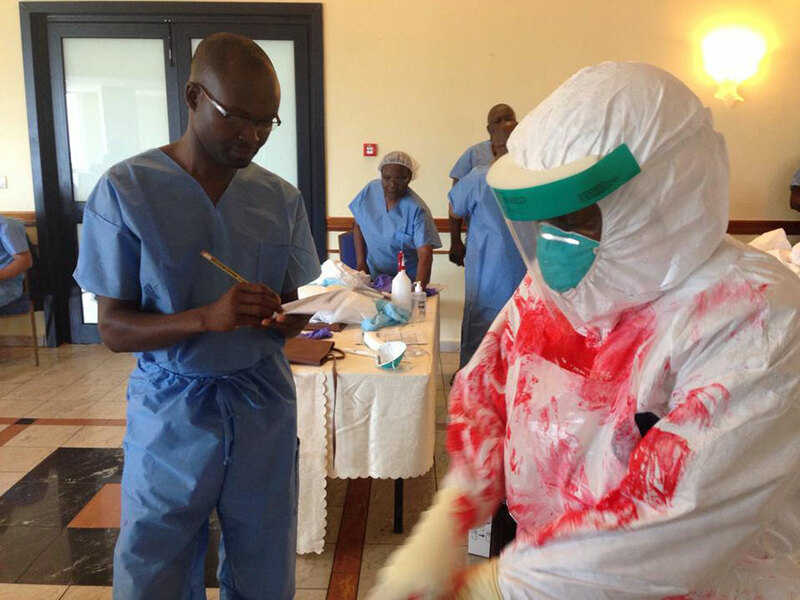 Jhpiego’s response in the region and at the epicenter of the Ebola crisis was coupled with an ambitious, innovative project to develop new protective gear for health workers that reduced the opportunity for infection. Working with our partners at the Johns Hopkins Center for Bioengineering Innovation & Design, Jhpiego co-hosted a weekend hackathon, bringing together experts and participants from across the university and the Baltimore, Maryland community. These dual initiatives—sharing our technical expertise in IPC and innovating to save lives with improved protective gear—reflect Jhpiego’s continued commitment to preventing the needless deaths of women and families through global health practice and technology. This blog originally appeared on mPowering .